*Actual On Road Price of Honda Livo at the dealership may vary. The Honda Livo 110 cc bike comes with new styling and body graphic along with a new analogue-digital meter console with the Service Due Indicator, clock, and a new low maintenance seal chain. 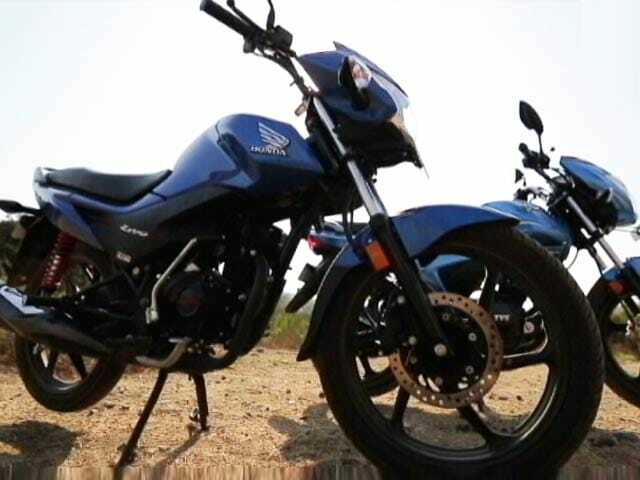 The engine remains unchanged as the bike uses the same 109.19 cc air-cooled single-cylinder engine that comes with Honda Eco Technology (HET) that makes 8.31 bhp and develops a peak torque of 9.09 Nm. Transmission duties are handled by a four-speed gearbox. The best thing about the design is that it isn’t loud, it is rather more on a sophisticated side. The robust fuel tank adds to the macho stance of the bike. Dimensionally the bike measures 2020mm long, 738mm wide and 1099mm high. Ground clearance stands at 180mm and wheelbase is arond 1285mm. Fuel tank capacity is 8.5 litres and low kerb weight of 111 kg hints at ample power to weight ratio vouching great economy and performance. Livo’s body wears a dual tone theme dominated by black and a contrasting colour theme. The handle bar is placed close to the long seat and the forward set foot pegs make it for a comfortable ride position. A tri-pod instrument cluster is equipped on the handle bar up front which appears modish. Power comes from an air-cooled, four-stroke SI engine displacing 109.19cc. The engine produces top power of 8.31bhp at 7500rpm along with 9.09Nm at 5000rpm. A four-speed transmission is mated to the 110cc engine which is claimed to offer top speed of 86 kmph. Built on the diamond frame, Livo features telescopic front forks and spring loaded hydraulic rear shock absorbers. Force to retard speed is derived from 130 drum brakes in front and rear. There is also an option for a disc brake in front. The bike rides on tubeless tyres measuring 80/100-18 are affixed in front as well as rear. Black finished rims are in sync with the rest of the body paint overpowered by black. In the 110cc commuter segment, Honda Livo faces stiff competition from rivals such as TVS Star City Plus, Hero Passion Pro, Yamaha YBR 110 and Mahindra Centuro. Honda Motorcycle and Scooter India (HMSI) has launched the Bharat Stage IV (BS-IV) compliant Honda Livo 110 cc bike in India priced at Rs. 54,331 (ex-showroom, Delhi). I agree with you all Livo bike cannot run faster than 40 km/hour because of weak engine, if at all u try to run it faster it start shaking and lot of unwanted sound being produced. I was also deceived by the agency called V D Honda in Delhi. After sale service is also extremely poor for Livo . In case of problems parts are very costly. Hence I strongly advise not to buy Honda LIVO. Livo is mileage wise v good. But pick power is dull. Compair to herohonda splendor plus 100 cc. Livo is 110 cc what is the meaning of 110 cc when pick power is very low. After on 60 km speed bike going to full vibration. I m very disappointed with this bike.agar aapke khoon pasine ki kahani hai to Honda livo me mat dalo, maito fas Gaya bike kharid ke aap log mat Faso. Company bike sell ker ke kama ke Beth gayee.paisa to hamara Gaya na. not a great fuchar bike. engin not saported hie seed . I am using this bike sinse October 2015. I really lost my money. More pick up with less control. Very uncontrollable body structure and very bad in speed. After speed of 50 - 60 km/h. It will vibrate like hell. Mileage is little satisfied but for only mileage we can not say it is a good bike.